It has been a week since I had to bring our little dachshund Willie to the vet for our final good bye. He came to us at 8 weeks old and stayed with us for 15 years. Our final act of love and kindness for Willie was the hardest decision that I have had to make. We miss him terribly. Many of you may remember when we lost his brother Benjamin. Another day of heartbreak in our home. We no longer have any dogs in our home. We have 1 siamese cat named Mayumi, we call her Yum yum. We also have a one legged African Grey parrot named Peggy. I haven't been doing much posting or designing lately. I am hoping to be able to bring something fresh and new to you soon. Here is a quick, easy and free pattern to make cup holder liners. Since getting my new vehicle I have become slightly (only slightly) neurotic about keeping it clean; trying to preserve that "new car" smell. There are 3 rows of seats, each row has 2 cup holders. I have made little cotton liners for each row. This way when a cold drink is placed in the holder any condensation will be absorbed by the liners. To make these little liners you will need an I hook, a small amount of cotton, a yarn needle and scissors or snips. ​A free crochet pattern for you! Rnd 3: Chain 2, 2 hdc in same stitch as join, *1 hdc in next stitch, 2 hdc in next stitch, repeat from * around. (36 hdc) join with slip stitch in 1st hdc. Fasten off, weave in ends. Do you like this pattern? Want to share it with friends? Please use the blue share buttons to the left to let your friends know where to find Cotton Cup-holder Liners. As always, thank you for taking the time to visit me here in Maine. September has turned out to be a very exciting month for Home made hats. As many of you know I was very sick a few years back. My credit took an extremely bad hit; I had over 11,000 dollars in medical debt. I began working for a retail clothing store a year ago; trying to save money and pay off my debt. I have been working really hard to get my credit back. ​For the past six years I have been driving a 1997 Dodge Dakota Sport. It turned 21 this year and has become less and less reliable for me. Last week my husband, Ken, drove me to Newport to look at used vehicles. I was looking for something that was 3 to 5 years old that would be safe for me to drive during the snowy, icy Maine winter. To my astonishment I qualified for a new vehicle!! This is my 2018 Dodge Journey. When I drove it off the lot it had 17 miles on it!! The color (which I love) is called Granite Pearl. I am a grey girl so this is the perfect color for me. I have been working all summer and now it is almost over. I can't believe Labor Day has come and gone; the kids are all going back to school and for all of us knitters and crocheters our season has begun!! To start the season off right I am bringing you a new, free wrap pattern. This pretty wrap is made with Lion Brand Yarn's Mandala. I used the Serpent colorway for my wrap. This wrap is worked from the center out, when you finish the first half you will begin working on the opposite side of the starting chain. this pattern is currently at the testers. As soon as I have it back I will post it here FREE for you. Tip: When buying your yarn for this project try to find two cakes with the same centers, this way your colors will match up. What you will need for this pattern is 2 cakes of Lion Brand Mandala, an H hook, scissors or snips and a big cup of coffee, tea or beverage of your choice!! I have made two Soft Waves Twin Afghans. This past Sunday my son Russ and his wife Rachel had a birthday party for their three children. Aden turned 7 Sunday, Evalynn turns 1 on Wednesday and Colby will be 6 on the 18th of July. Instead of back to back birthday parties they decided to have one big one for all three! For each one of these afghans I used 5 7 oz cakes of Hobby Lobby's Yarn Bee Sugar Wheel. I don't know why but one came out smaller than the other, a full 2.5 inches shorter. One is 67" and the other is 69.5". The top blanket is in the Blueberry Pie colorway and the bottom one is the Minted Macaroon colorway. Each cake has 5 different coordinated colors. I still have two more to make and then all of my grandchildren will have a twin sized blanket from Grammie. Our little Dylan will be 7 in December. I already have the yarn for his, Parisian Macaroon. It has light blue, navy, teal (his favorite) and a limey green. I won't be making Dylan's for a little bit. I just don't have it in me to make three in row!!! I made the Lunar Crossing Square Blanket for Evalynn. This pattern is from Kim Guzman of Crochet Kim. For this blanket I used 2 cakes of Hobby Lobby's Sugarwheel. This time in the Raspberry Tango Colorway. I found this pattern easy to follow and very well written. I have 8 grandchildren. I have made 4 of them afghans. This summer I am making the last 4. Each of my grandchildren will have a twin sized "Grammie Blanket." I got bored with the last pattern I used. I may still use it at another time; but for now I have decided to use my Soft Waves Baby Blanket pattern and adapt it to a worsted weight and a twin size. 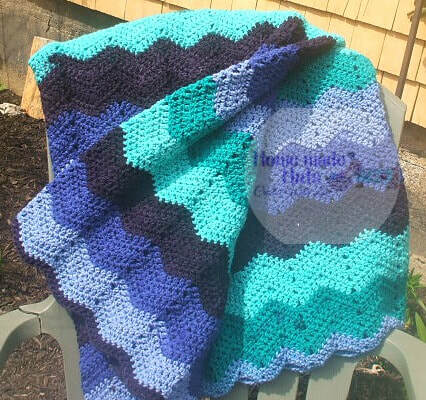 The yarn I used for this first afghan is from Hobby Lobby. It is Yarn Bee Sugar Wheel in the Blueberry Pie colorway. These cake style yarns come in a 7 oz/355 yard "cake." Each afghan takes approximately 5 cakes. I am working on the second afghan now. This one done in "Minted Macaroon." For this pattern I am using my K Streamline hook from Furls. These lovely hooks are light weight, reasonably prices and very easy on the hands and wrists. I am hoping to have the pattern written up and edited soon. Keep an eye out for my next post with the FREE pattern included in it!! Until then, Happy Hooking one and all. This post contains affiliate marketing links. If you make a purchase through these links I make a small commission at no additional cost to you. As always thank you for reading and visiting me here in Maine. Shop for your Furls Streamline Hooks and other fine Furls products here!! !